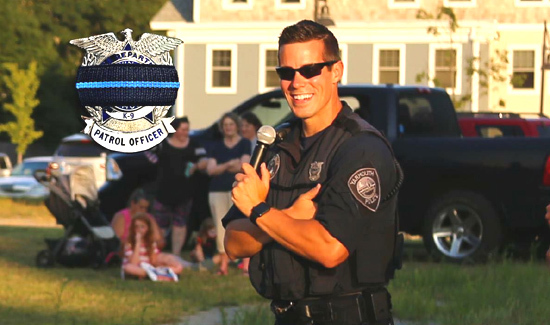 Yarmouth Police Department K9 Officer Sean McNamee Gannon, age 32, died on impact in the line of duty from a gunshot wound to the head on April 12th, 2018. Born August 22nd, 1985 in New Bedford, MA, he graduated from All Saints Elementary School in 1999, and Bishop Stang High School in 2003. Gannon graduated with honors from Westfield State University in 2007 with a Bachelor of Science in Criminal Justice, a Master’s with honors from Massachusetts Maritime Academy with a degree in Emergency Management in 2011, and the MBTA Municipal Police Academy. Gannon’s internships included Nantucket Police, Westfield Police, and earned certifications as an EMT and Life Saving Instructor. Gannon started his Law Enforcement career at Stonehill College in 2007 as a member of the Campus Police before joining the Yarmouth Police Department in 2010. Gannon was part of the Emergency Management Unit, a part-time member of the Proactive Anti-Crime Team, and he was the first full-time K9 narcotics officer for YPD with his devoted K9 Thor. After retiring K9 Thor, Gannon acquired his beloved K9 patrol dog Nero, who was also shot and injured at the scene of the crime but was rescued and is expected to survive and return to the Gannon family. Sean leaves a legacy of high moral integrity, infectious humor, and collaborative work with colleagues. He enjoyed travel, working with his hands, donating his time to Big Brother/Big Sister and being outside. Sean leaves his wife, Dara (Bryan), his parents, Patrick and Denise, his siblings, Timothy and his fiancé Mary, Martha and her husband Derrick, his Little Brother Riley and his mother Nicole, his in-laws Kathy and Dean Bryan, and their son Ross, along with many relatives and friends. 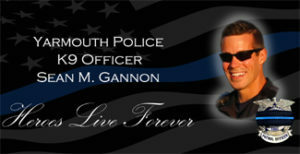 In lieu of flowers, please make a donation to Yarmouth Police Foundation or The Cape Cod Foundation.